The 30' Smart Endzone Camera uses the most advanced technology in the industry. Film the game wirelessly from your iPad! (iPad not included). Use the virtual, on-screen joysticks to pan, tilt, and zoom from the stadium's Press Box. And with EDGE Replay built-in, each clip is downloaded to all connected iPads and ready for replay in seconds. No long cable bundles, monitor screens, or remote controls. 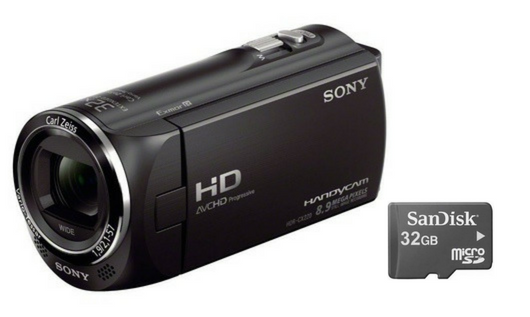 Filming from the endzone has never been easier! Replay Subscription 1st Year Free! 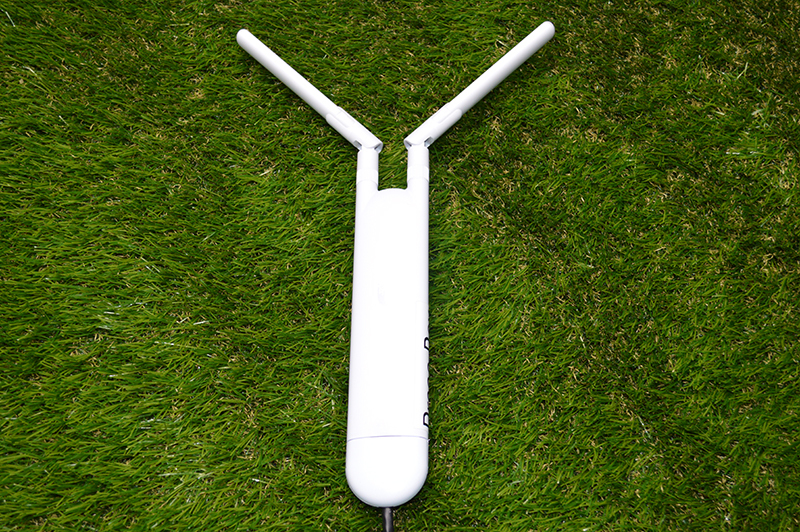 In the Endzone, simply connect your Smart Camera to the Endzone Bridge antenna. This will allow for communication in the Pressbox or on the Sideline. The iPad Connection Point antennas will serve as the access points for your iPads to connect to. If you are in the Press Box, you'll locate the private WiFi network designated as Pressbox and connect in the settings of your iPad. The same procedure applies to iPads on the Sideline. The Bridge antennas are what allows all data communication between the Smart Camera (and any additional EDGE Replay devices) and iPads. 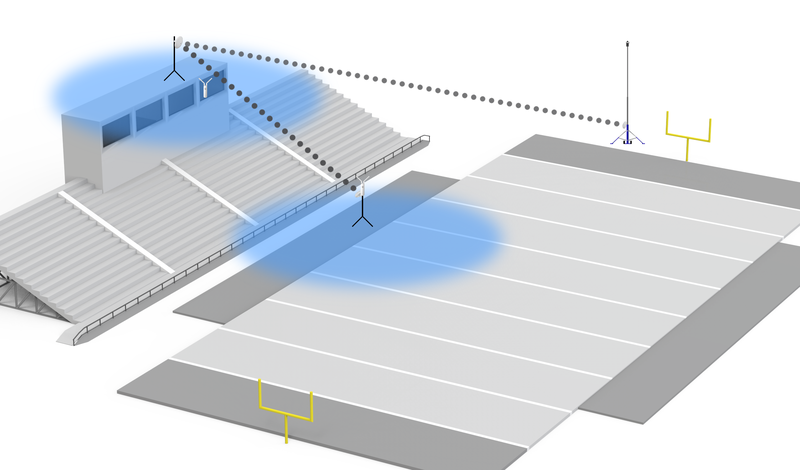 Once connected, point your Endzone Bridge antenna at the Pressbox. Perform the same for the Sideline Bridge antenna. In the Pressbox, point its Bridge antenna to the midway point between the Sideline and the Endzone Bridge. 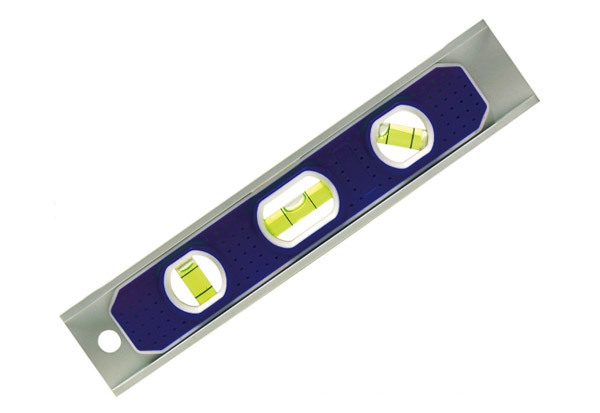 Look for the four lights and ensure levelness for optimal polarity and connection strength. 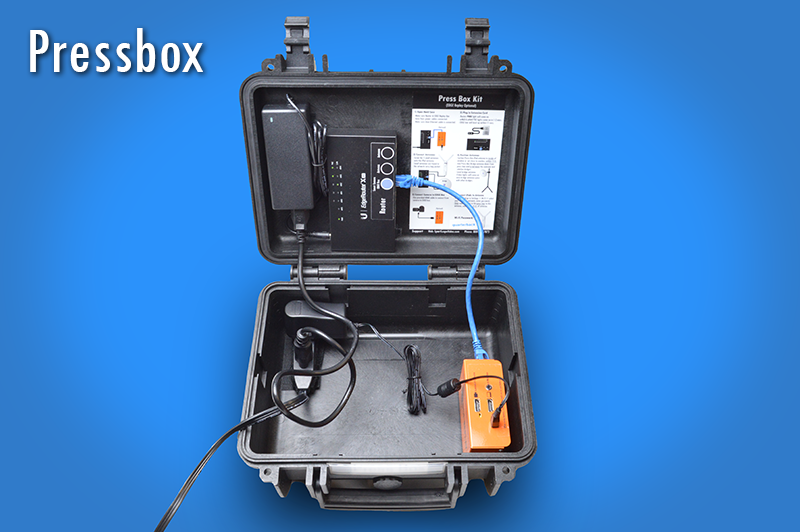 The Pressbox Hardcase contains your router, power strip, and if you have a Pressbox EDGE Replay angle, the EDGE recording device. Simply connect power, your iPad and Bridge antennas to the router, and optional HDMI if using an EDGE Recorder, and this station is ready to go. This will be your main hub and is recommended to set up first. 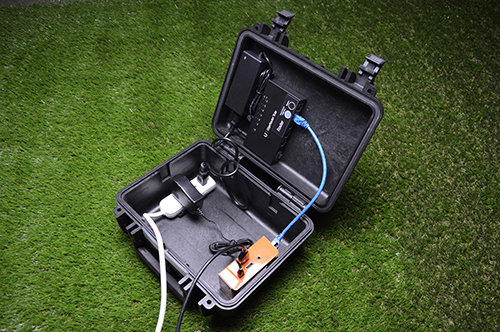 The Sideline Hardcase contains your Switch and power supply. The switch is slightly different than the Pressbox router. It's primary function is to allow communication between iPads and the Pressbox hub. Connect the iPad and Bridge antenna to the Switch and you're ready to go. 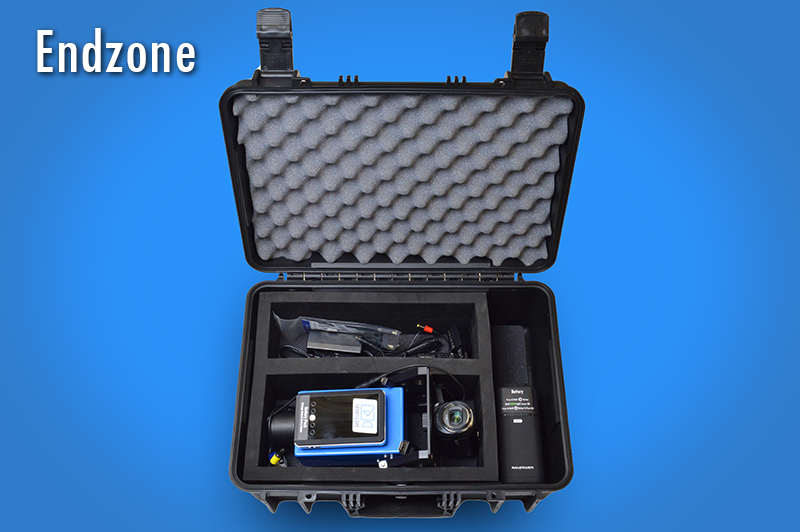 The Endzone Hardcase contains your POE injector and power supply. The injector is required to give power to the Endzone Bridge antenna, which will send your Endzone video data to the Pressbox hub. 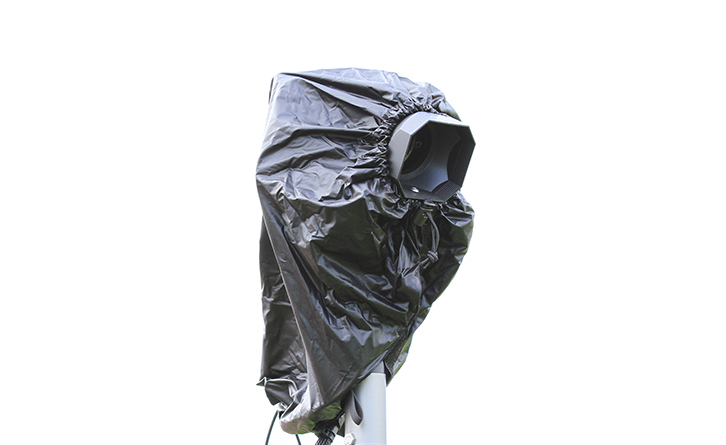 The 30' Smart Endzone Camera is a highly durable, simple-to-use, American-made tower with four locking legs. 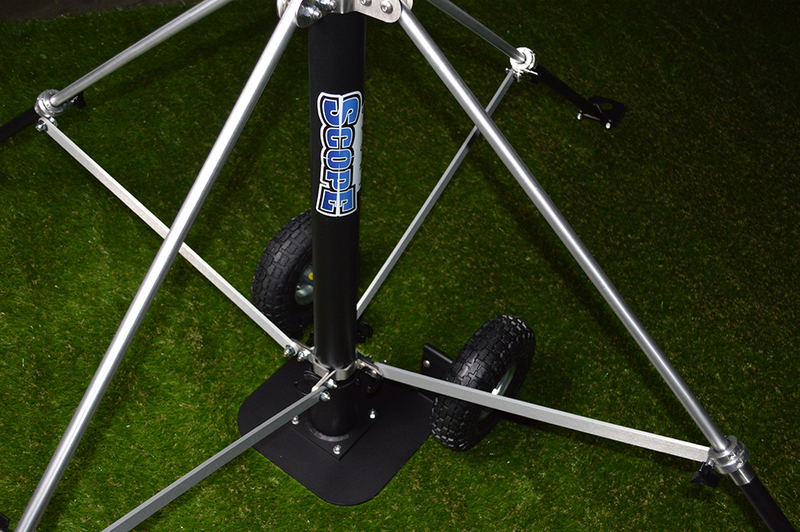 The tower sits on a base plate with wheels for easy maneuverability. 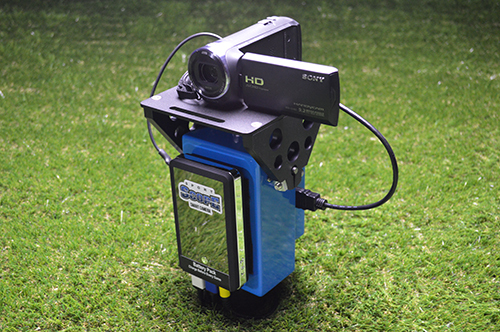 The Sport Scope Smart Camera is the only endzone camera on the market with a custom made fully wireless pan / tilt head. The durable design houses incredibly smooth internal motors, a lightning fast streaming/replay device, and only requires a single ethernet cable connection to the ground side bridge antenna to send your private network to all connected iPads. For the first time, you can control the camera at virtually any speed by the simple touch of a finger. The Wireless Pan/Tilt head has everything you need contained inside. Start and stop the camera's recording to its memory card and zoom with precision all while obtaining instant replay to your iPad. Perfect for all sports. To operate the 30' Smart Endzone Camera, you'll be required to download our Free Sport Scope App from the Apple App Store on your iPad (iPad not included). This sophisticated App allows you to create games for recording, control the movement, zoom, and record function of the camera, operate the replay and all related features, tag plays by ODK, Down, Distance and more, and adjust settings to meet your filming needs. 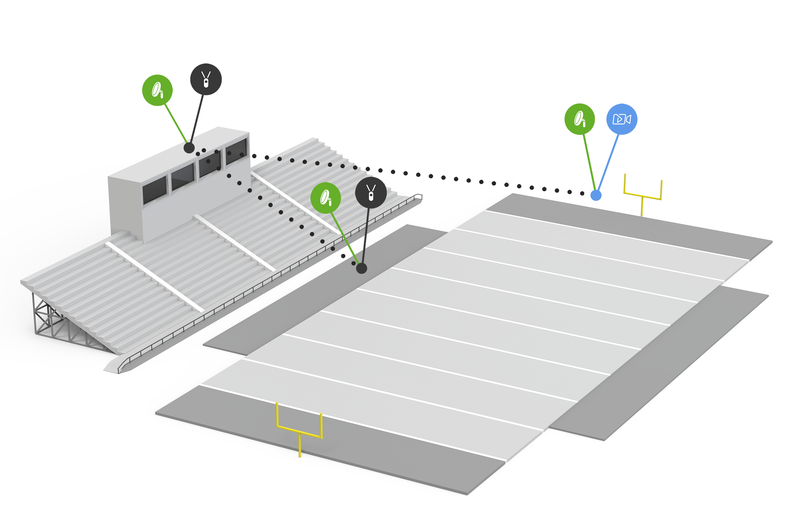 The Sport Scope Smart Camera requires three battery power sources: one for the Pan/Tilt head and camera, one for the bridge antenna on the ground in the endzone, and one for the network station on the sideline. The 30' Smart Endzone Camera comes standard with all long lasting batteries. 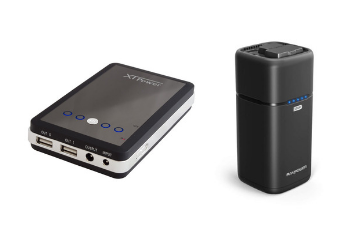 Each battery will last 5+ hrs, which will allow you to film several games with your end zone camera on one charge. 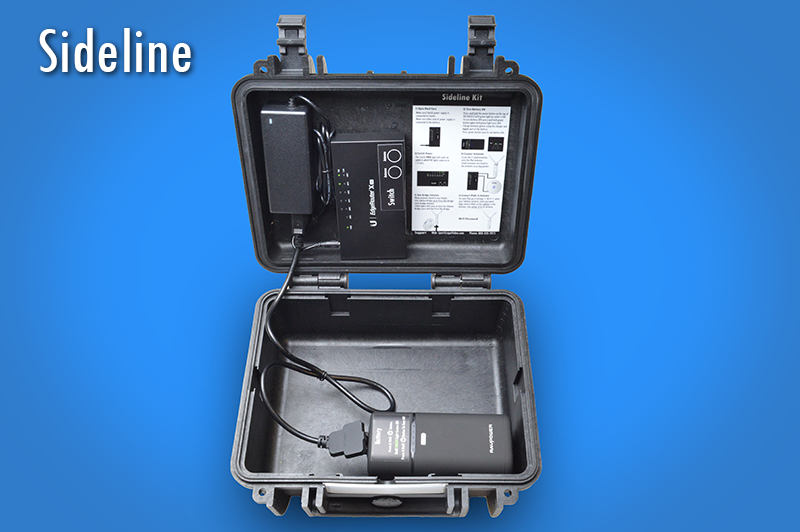 The 30' Smart Endzone Camera requires a router to encode your private network and deliver it to the iPad antennas. This unit comes equipped with a router for both the Press Box and Sideline hotspots. The weather proof antennas serve as bridges and hotspots for your wireless private network in the Press Box and on the Sideline so you can connect to your camera and replays with your iPads. The hard cases protect and organize all the important electronics that make up our complete end zone camera package. The hard case is an important part of our system because it ensures that the most vulnerable parts of the endzone camera are always safe and accounted for. Use this to weather proof your components while filming the game. The Sport Scope Smart Camera comes standard (new EDGE customers only) with a one-angle EDGE Replay subscription for 1 year. A $1500 value! All recorded clips will automatically download to your iPad for easy review. After your free 1-year subscription you may continue your subscription for $499 a year. Add as many additional EDGE Replay angles as you want and the annual subscription fee remains the same! "After doing our homework in looking for an End Zone camera and a Sideline Reply system, I can say we found the best out there." "After doing our homework in looking for an End Zone camera and a Sideline Reply system, I can say we found the best out there. We chose the 30’ Smart Camera with built-in endzone EDGE replay. We found the setup easy and fast, the quality of the video for the replay awesome, and the service outstanding. Everything about this system and company was first class. Looking forward to adding on to our existing system for next year." "After a game with failed end zone camera hardware and Hudl Sideline Replay, we made the switch mid-season to the 30' Wireless Smart Endzone Camera & EDGE Replay system." "After a game with failed end zone camera hardware and Hudl Sideline Replay, we made the switch mid-season to the Sport Scope 30' Wireless Smart Endzone Camera and EDGE Replay system. The set-up for both was seamless. Learning how to control the camera from the press box using the iPad was easy and our video personnel used it for the first time with very little practice. Even with the majority of our games this season in bad weather and a few games in a large professional stadium, the hardware set up was easy and accommodating. In both situations they worked great. A real difference maker was the great customer sales and service. All questions we had before, during, and after games were answered quickly and they shipped their products promptly. 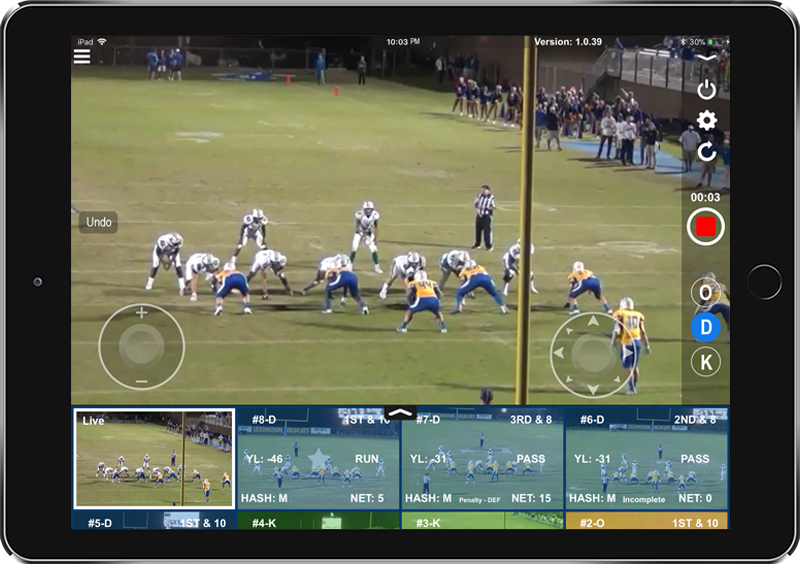 With the EDGE replay system, the replay clips would download quickly and with our sideline set-up, we could watch the previous play in the press box and sideline while the next play was happening. Compared to the inconsistencies that we dealt with over the last 3 seasons and the service provided by Mike and the entire Sport Scope crew, we couldn't be happier that we made the switch." "Sport Scope demonstrates a solid commitment to the customer with patient and professional technical support!" "We have been using the Edge Replay System for the last two seasons and the system has contributed to our success. Being 1-9 in 2016 and 19-3 during the last two seasons, the system has made a big difference in close games and we can directly attribute 4 big wins to the always ready replay, which created game changing plays. Sport Scope demonstrates a solid commitment to the customer with patient and professional technical support! Derek and the crew are great, they have answered every call in a timely fashion and have provided expert advice resolving each issue presented. This past season we acquired the Smart Endzone Camera with built-in EDGE Replay, which has improved camera operator continuity. Although there were some challenges in the initial configuration, the Tech Guys kept looking to make improvements. This year's season end result, using a multi-point network was tight, enabling nearly instantaneous camera response. The replays came in at only 1.5 seconds of download time. Having this high quality imaging available to coaches within moments of play completion greatly improves in-drive adjustments. We highly recommend Sport Scope products and commend the customer support, we plan to be a customer for the foreseeable future." "We had a lot riding on the Sport Scope Smart Endzone Camera and EDGE Replay system and it did not disappoint; in fact it exceeded our expectations!" "We had a lot riding on the Sport Scope Smart Endzone Camera and EDGE Replay system and it did not disappoint; in fact it exceeded our expectations! We could control the camera from the sideline or press box and since it was an ipad it was quite easy and we could use a coach or manager as the controls. The replay (on another ipad) was almost immediate and we could watch the previous play on the sideline while the next play was being sent in. For us, that was a HUGE advantage over the Hudl Sideline. Having a picture perfect endzone view on the sideline was tremendously helpful and the service provided by the entire Sport Scope crew was also phenomenal. Second endzone system we have used and glad we switched!!" "The ability to have our end-zone camera person in the press-box with the coaches was really helpful. It allowed us to watch live end-zone footage . . ."
"The ability to have our end-zone camera person in the press-box with the coaches was really helpful. It allowed us to watch live end-zone footage to see where they are lining up on defense. We also didn't have to worry about someone out in the cold or needing help and being far away from coaches. We had a freshman handle the controls and he did an amazing job very easily with little instruction. We didn't have to find a parent or some other adult to handle things. It was easy enough for a freshmen that has never played football before. The wireless function of being able to record with and watch film on the iPads during the game was great. We also didn't need power down at the tripod tower. The batteries worked great and we never needed to plug anything in during the game down on the field. When I messed up a set up process, the tech support answered the phone quickly and walked me through any issues I had right there on the spot. I thought the best thing was how easily it inter-cut video on Hudl for us. We uploaded both films quickly and it was a seamless inter-cut process." 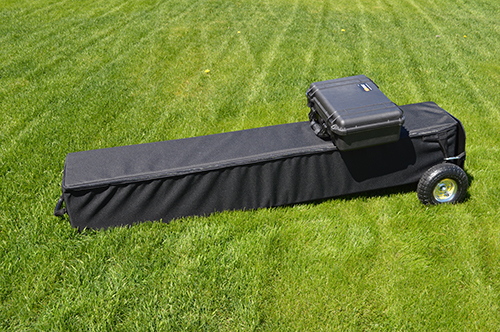 "This past season I had finally had enough of Hudl Sideline 2-angle system. A playoff season, a full season, and a partial season. Same result: problems, problems, problems . . ."
"This past season I had finally had enough of Hudl Sideline 2-angle system. A playoff season, a full season, and a partial season. Same result: problems, problems, problems! Looking for a replacement solution, I wanted something very user friendly, affordable, dependable, Hudl Mercury friendly, and be the quality that I expect out of my program. After looking at a lot of options, I found it ... EDGE Replay! I really cannot say enough good things about Sport Scope EDGE Replay because I believe them to be a GREAT company! If you have lived my frustration with your past system, you understand. If you need any validation of this system, please do not hesitate to contact me. WE love it!" Is sideline instant replay illegal for high school football? Sport Scope & EDGE Replay is legal if you follow NFHS rules. In 2013 the NFHS released rule 1.6.1.2 which says: "NFHS Football Rules, rule 1.6.1.2: USE OF COMMUNICATION DEVICES EXPANDED (1-6): The committee has expanded use of communication devices to allow coaches, players and non-players to use any form of available communication technology during authorized conferences outside the 9-yard marks (7-yard marks in nine-, eight- and six-player competition), on the sidelines and during the halftime intermission period. Use of communication devices by players except during conferences outside the 9-yard marks continues to be prohibited." No internet is required to run the 30' Smart Endzone Camera because we create a closed, private network to run the system. No. The computer operating the Smart Camera Head is built inside the unit. You only need an iPad to operate the system. For the Smart Endzone Camera you may use up to 5 iPads. Each station uses a bridge antenna to communicate with the other. Additionally, the Press Box and Sideline stations each have iPad antennas, which create designated access point hotspots on the network for your iPads to connect to. Initial setup takes about 15-20 minutes, after a few uses setup drops to 10 minutes. How fast do videos download? No. The 30' Smart Endzone Camera system comes equipped with two batteries. One battery powers the Smart Camera head and another battery powers the groundside bridge antenna. How many replay angles can I connect? You can have unlimited angles.